Hey, lovely! Welcome to the Valentine’s Day Spa Giveaway! Too busy for the spa? Why not get a luxurious massage right in the comfort of your own home? Naipo’s new Shiatsu Back Massager lets you enjoy a fantastic Shiatsu style massage anytime, anywhere! 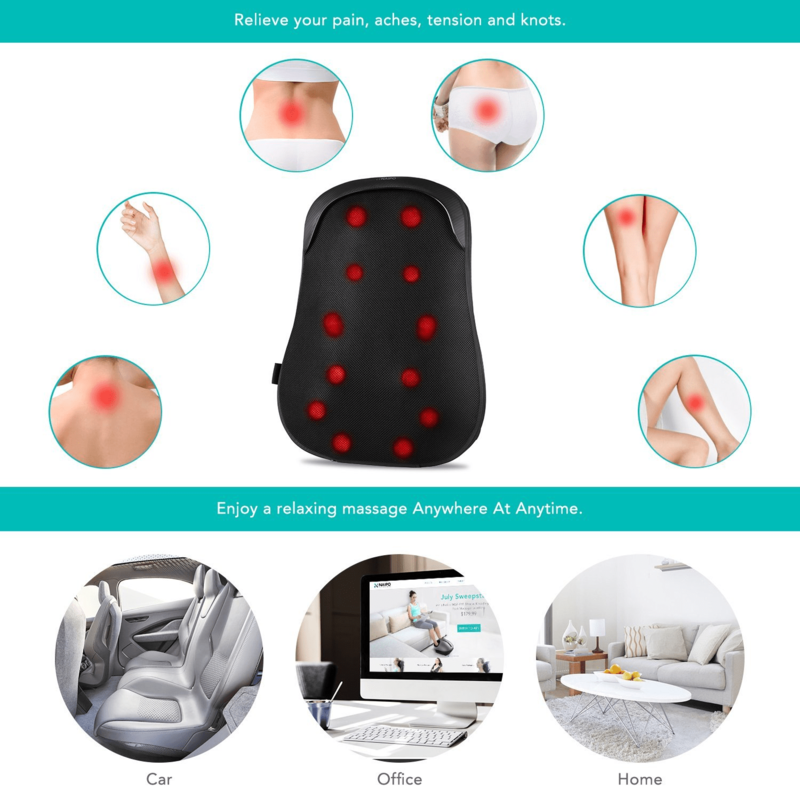 The ergonomic construction fits perfectly in the shape of your back while its 12 deep-kneading rotating nodes work wonders to relieve aches, knots and muscle tension. All you have to do is sit back, press the ‘Power’ button, and simply let your stress melt away. Give yourself the gift the relaxation at home, work or when you travel. Fast-acting relief meets convenience with the Naipo Shiatsu Back Massager Cushion with Heat. Get it right now for ONLY $75.99 during this special promotional period (It will end on 13th September) it’s $14 cheaper than usual. You only get one shot lovelies! Do not miss your chance! In order to repay the love to those who love massages and subscribe this blog, Naipo and MyStyleSpot are offering a coupon code that can also be used after the promotional period (COUPON CODE: MGSBK750 –Start from 14th September), so even if you didn’t catch the activity, you can still buy it for just $76.49! keep you feeling relaxed all day. One button to start, easy to control and light weight to carry. Enjoy a relaxing message Anywhere At Anytime. Whether you are at home, daily commute in your car or at work in your office, get a shiatsu massage can relieve your stubborn knots, tight joints right away. Shop the Naipo Back Massager Here on Amazon. Every week, T-Mobile Tuesdays thanks T-Mobile customers with free stuff and a chance to win epic prizes—like a once-in-a-lifetime trip, wardrobe makeover, amazing sports and entertainment experiences and more. We’ve partnered with some of the best and coolest brands to thank our customers every single week, including Fandango, Lyft, Papa John’s, Shell and Subway to name a few. On Tuesday, August 29th, every T-Mobile customer can get a one-year subscription to Glamour Magazine or Teen Vogue from T-Mobile Tuesdays. But that’s not all! Two grand prize winners will also take home a prize package that includes an $1,000 SpaFinder Wellness gift card, good at more than 20,000 locations worldwide, plus a $500 ASOS gift card to be used towards your favorite wardrobe. Anyone can enter to win the grand prizes, even carrier customers – at T-Mobile we share the love. You don’t have to be a T-Mobile Customer to Enter! Also, T-Mobile is letting me GIVEAWAY 10 subscriptions to Glamour or Teen Vogue Magazine to my lovely readers! ENTER TO WIN a year subscription to Glamour or Teen Vogue Magazine in the Rafflecopter form below! Hurry! Contest Ends Tuesday, August 29th! *MyStyleSpot is not responsible for prize fulfilment.